Where has the summer gone? Today marks the start of Autumn. I really can't believe that September has arrived, somehow August seemed to flash by full of rain and busy times. This coming month is all about handmade for me, it's the start of new projects and completing work in progress. I'm also heading off to The Handmade Fair later this month too. To kick start the month I wanted to tell you about a handmade baby shower that I hosted at my home for Beth, a close friend of mine. Gathering together some of Beth's best friends one Saturday this summer, we spent an afternoon having a brilliant catch up over food, baby shower games and enjoying quality time together. I have known Beth for many years and she is a really special friend to me. Hosting a handmade baby shower for Beth was my way of saying thank you but also to organise a special get together to celebrate her exciting new phase of life heading into the world of motherhood. 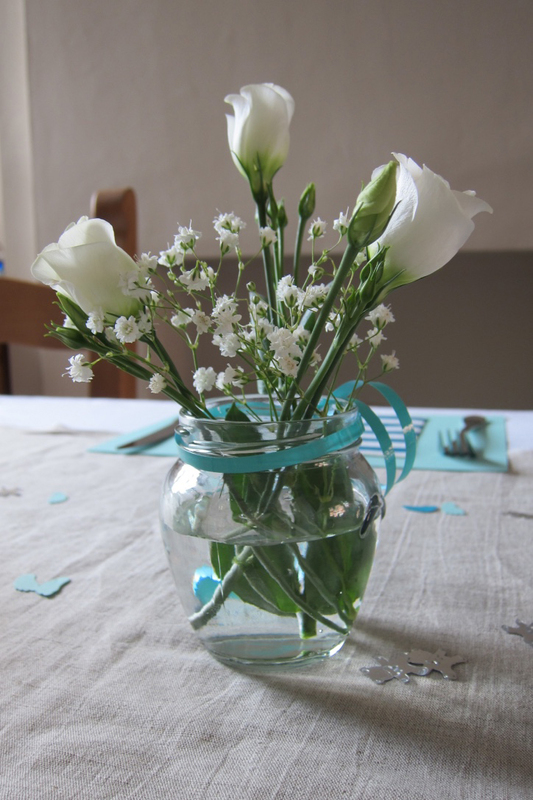 For me both the process of organising a get together and making things are some of my favourite pastimes, so creating a handmade baby shower became a fun project that I really enjoyed and immersed myself in. 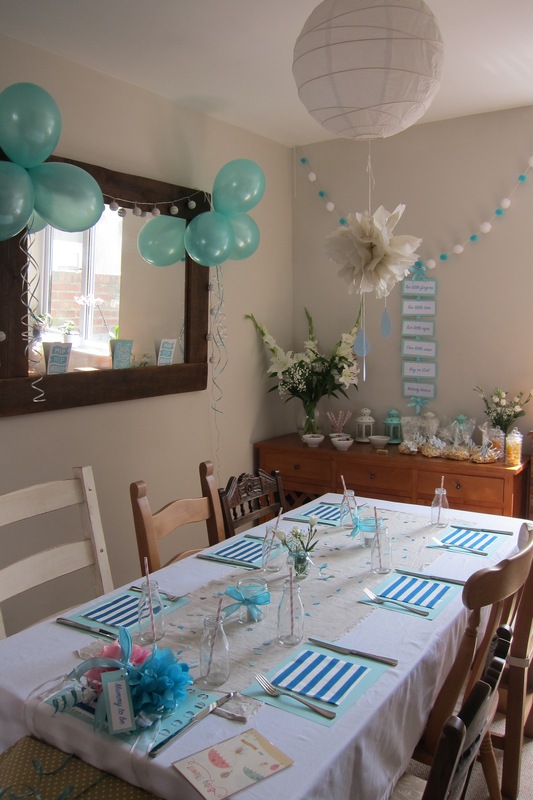 Having a baby shower meant getting Beth's friends together in one place, choosing great food and drinks, finding a great gift, and decorating the space with handmade touches creating a pretty space and theming the party. I thought it would be great to share with you how I hosted a handmade baby shower and talk through a few of the key aspects I focused on for the day. I hope they help deliver a little inspiration at the start of this handmade month. Planning the baby shower itself, what it would involve and how it would feel, was something that I had been thinking about for a few months. I started scouring the internet for styling ideas and pinning them to a secret board on Pinterest as soon as Beth told me she was pregnant. Armed with lots of ideas I started thinking about those that I knew I could make happen but also those that I knew that Beth would love. I spoke to Beth about organising a get together and we jointly contacted her friends to book in the date and to confirm numbers. With a perfect number of people to fit around my dining room table I then was able to refine the ideas I had for decorating and hosting the day. As I mentioned some of the planning was carried out early on however most of my favourite ideas for the day were made the week or so before the baby shower, and a few finishing touches came together the night before and morning of the baby shower. I kept my ideas altogether and organised by creating to do lists, food and supplies shopping lists, and made a separate list of the handmade touches to create for the day. Choosing a theme for the baby shower was so much fun, I had so many different ideas that I could've gone with, however I decided to go with a colour theme that would mean something to Beth. Rather than the typical blue and pink, I went for the colour that I knew Beth would love, the colour of the baby's nursery. 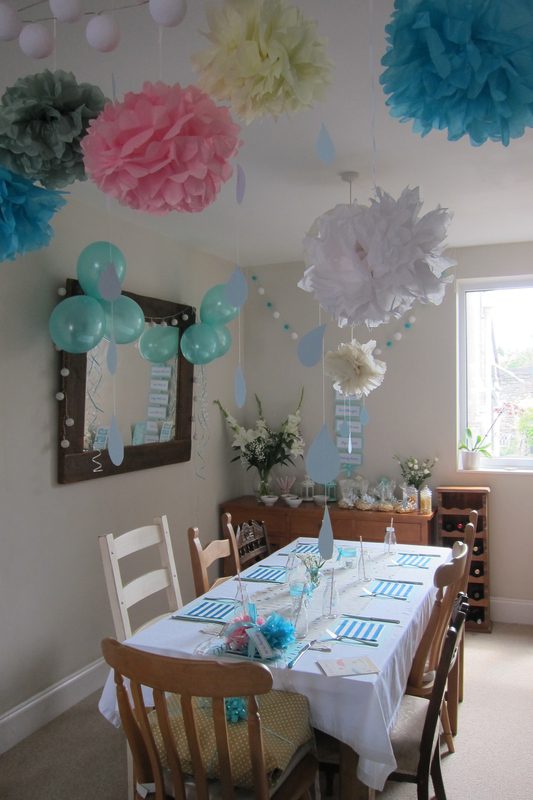 Beth and her husband had recently finished decorating the nursery a light teal /mint colour so I knew instantly that this would form the main colour theme for the party alongside white and a few touches of pastel colours. I tried to use the theme throughout, finding balloons and ribbons that could be used to add decorations to the room. To make the day extra special I really wanted a large portion of the baby shower to be personalised to Beth and to create some handmade elements to make the room feel different and decorated like a party. 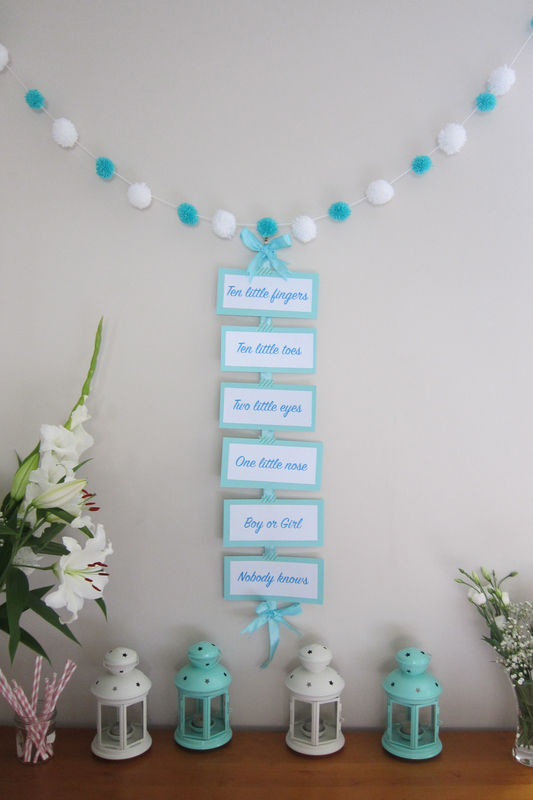 I made a woollen pom pom garland in the baby shower theme colours and hung them up over the side board to create a focal point for the room. I used two sizes of Clover pom pom makers and made them whilst watching TV over a few evenings. I wanted make a pom pom garland that Beth could take home at the end of the day and add to the nursery if she wanted to. 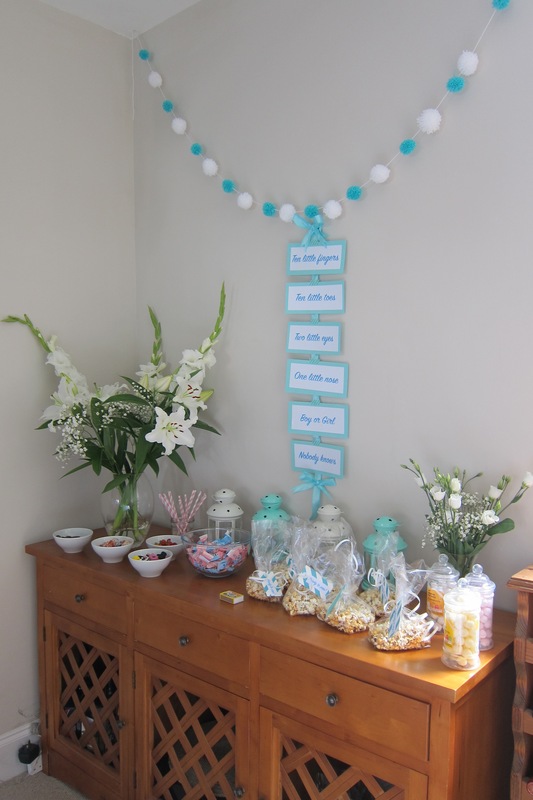 I made a little banner using wording ideas that I had seen on Pinterest and hung this below the pom pom garland. I typed up the words, printed them out and mounted them on coloured card and stapled them to the wide mint coloured ribbon, tying pretty bows at the top and bottom. Hanging from a picture hook I positioned it above some pretty Ikea lanterns to create a focal point in the room. I joined in with the craze for tissue paper pom poms, selecting a range of pastel colours and making them using a few different methods I found online. To enable them to hang down in an attractive way I attached them onto a bamboo cane and secured the cane above our archway that divides the lounge and dining room. I cut out some light blue card into the shape of rain drops to add to the 'shower' theme and strung them together using some white cotton, fixing them to the bamboo cane so that they dangled down into the room. 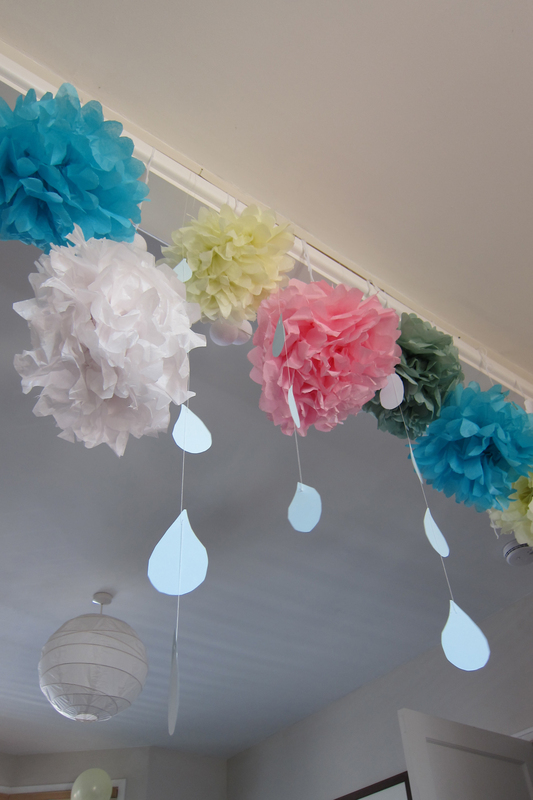 I also made a pom pom and rain drops that I hung from the central light over the dining room table. I wanted Beth to have something special to wear on the day and so instead of a making a rosette, I made Beth a 'Mummy to be' above the bump band. 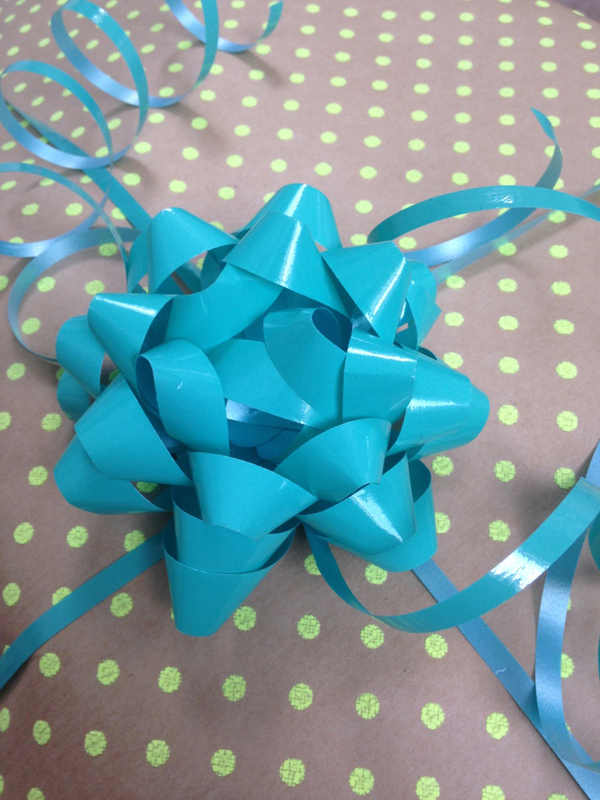 It was made with small tissue pom poms attached to a ribbon. I added other ribbons to add a little bit of extra detail and finished it off with a little label that said 'Mummy to be'. If I had known the exact due date I would've added this to the bump band as well. I made the bump band so that it could sit over the bump or be placed round the bump. I placed it at the head of the table for Beth to see when she arrived. The colour theme of white and teal/mint came together across the balloons, table settings and decorations throughout the room. I wanted to keep the table simple and so I added a piece of linen as a simple table runner on top of a white table cloth. I bought coloured sheets of paper to brighten up the table and used them as placemats. I added striped napkins on top of the placemats and also tied ribbon onto two Bonne Maman jam jars, adding a tea light into each. For Beth's placemat I also cut out a border of baby feet using my paper punch and scattered the punched shapes onto the table as well as some baby themed table confetti. As part of the day I wanted everyone to take away a little gift and so I made popcorn. Flavoured with sugar and cinnamon, I added a ladle full into a clear bag for each guest, securing with a small piece of curling ribbon and a label saying 'Ready to pop' as a fun touch. Decorating with flowers Alongside the handmade decorations I wanted the room to feel really special. For me adding vases of flowers always adds an extra pretty touch to a room. 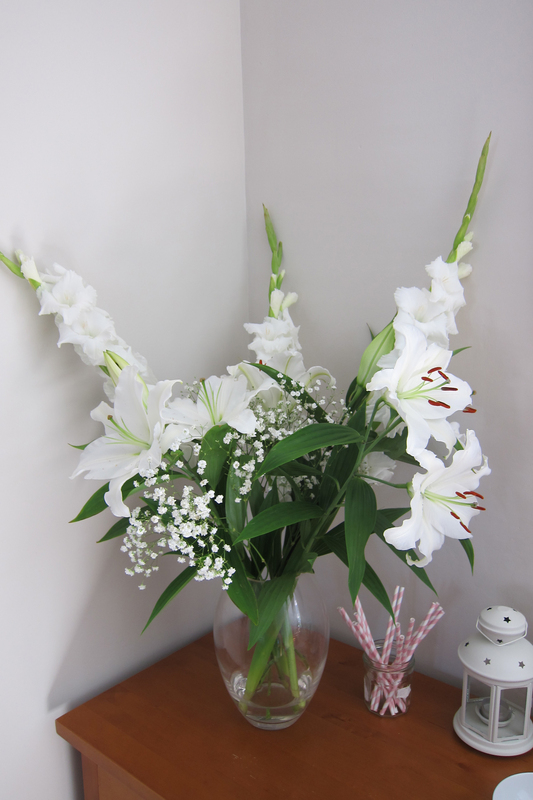 From a local flower stall I bought white flowers that I thought may work across a variety of vases I had. 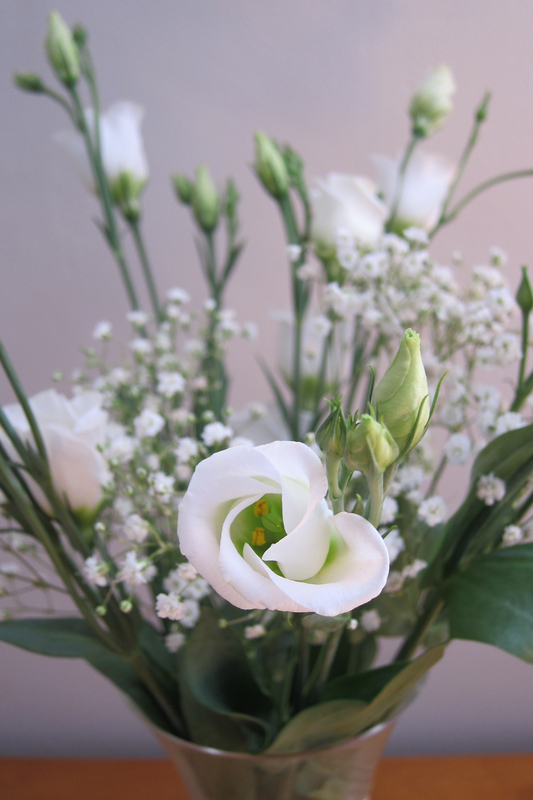 I bought 3 gladioli, a bunch of lillies, a bunch of gypsophila, a small bunch of stocks and a bunch of lisianthus. On the night before the baby shower I opened up each bunch and arranged the flowers into a few combinations of pretty displays. I placed the stocks into a jug by themselves and added them to the coffee table. and I made two arrangements for the side board to fit the vases I had available. I positioned the two biggest arrangements on the sideboard to help form a focal point for the room. 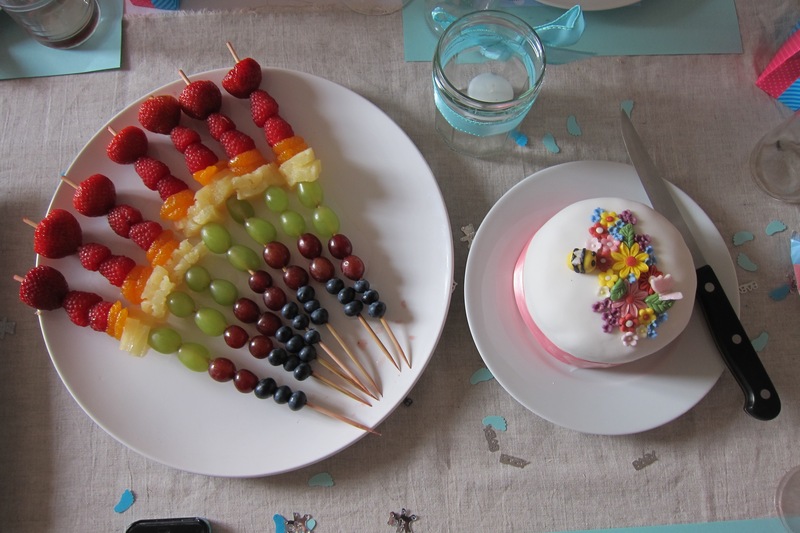 Food is a really important element of any party. Using the numbers of guests as a guide I was able to plan a sit down summer lunch. I wanted it to be simple and so went for two courses, a main buffet course and pudding. 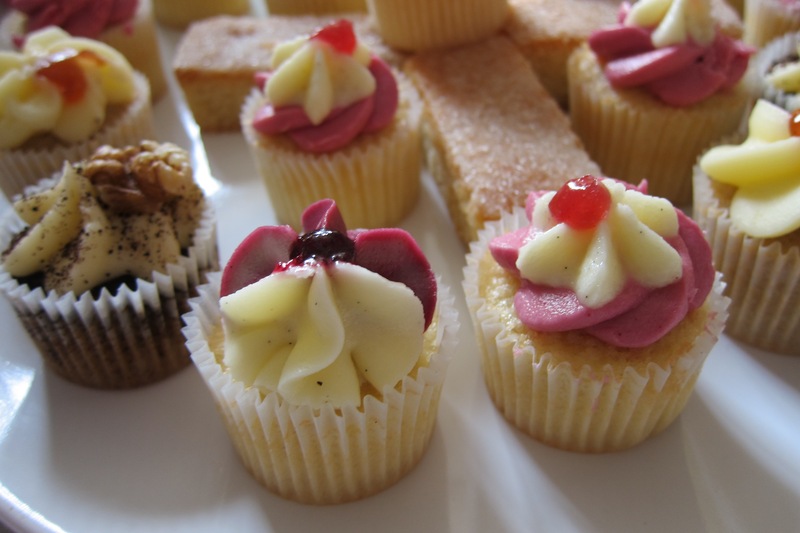 I was very conscious that a number of our friends had a range of dietary requirements, with a vegetarian friend, a dairy and gluten intolerant friend, and Beth's sister getting married a few weeks after the baby shower, I wanted to create a balance of food that everyone could eat. Initially I wanted to have an afternoon tea but decided to simplify this, finding healthy and easy things to make and drafting in some of our friends to bring things to add to the spread. We had a variety of yummy salads, including a chickpea and roasted pepper salad, a courgette, mint and lentil salad, tomato and mozzarella, as well as a bowl of mixed salad leaves. Alongside the salads we had a mushroom frittata and bread. For the puddings I decided to have a variety of options available, both healthy and a little indulgent. 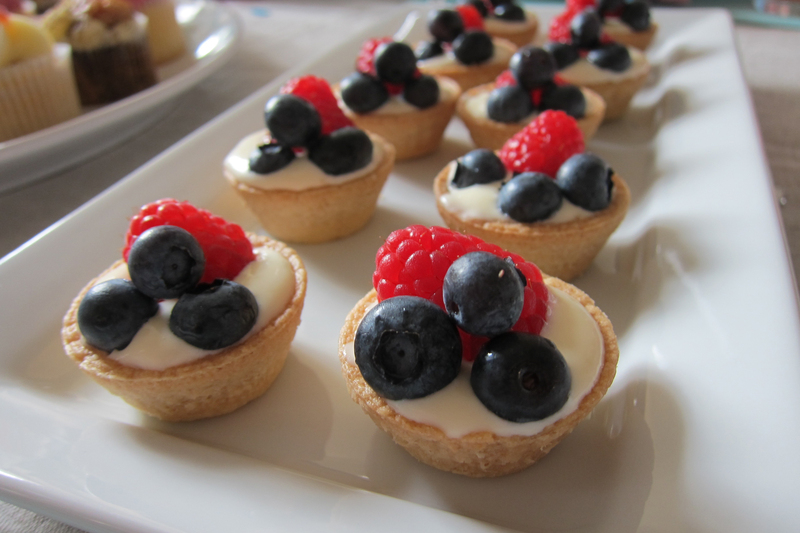 To help save some time I bought a variety of mini cupcakes and gluten free cake slices, I made rainbow fruit skewers and also assembled little pastry cups with lemon curd flavoured creme fraiche topped with summer berries. We also had a side board full of small bowls of chocolates, bon bons and jelly babies for extra sweet snacks. The drinks for the afternoon included prosecco, baby-friendly 'Celebration Shloer', Fentimans Rose Lemonade, Belvoir elderflower and rose presse and Belvoir elderflower cordial. The rose lemonade was served in small milk bottles with pastel pink striped straws, to work as an additional glass and add to the party vibe. Beth's sister sourced some fantastic baby shower activities. There were a variety of activities from blind folded stick the bottle on the baby, to a game called deliver the babies where we had to be blindfolded and pull out the babies from a bowl of sweets. We also played guess the baby body part from baby scans, unscrambled nursery rhymes and a had a speedy word search to complete. They were fun to do especially to keep us all energised after lunch and sparked lots of baby related conversations too. Near the end of the afternoon we all completed message cards for the mum to be and we also had lovely personalised baby shower party bags to takeaway too. Instead of buying gifts for the baby, we decided to pool our money together and buy Beth something we knew that she would love. We thought that it would be special for Beth to have a gift of her own, as we knew that she would receive lots of gifts for her new arrival. Beth had spotted a changing bag whilst I was out shopping with her one day and had really loved it. I asked Beth if there were any special items that she would like and she gave me a small wishlist. The bag was listed on there and so we all contributed to the changing bag. I wrapped the bag in some pretty brown paper with yellow spots and added a bow and curling ribbon in a contrasting teal to match the theme. 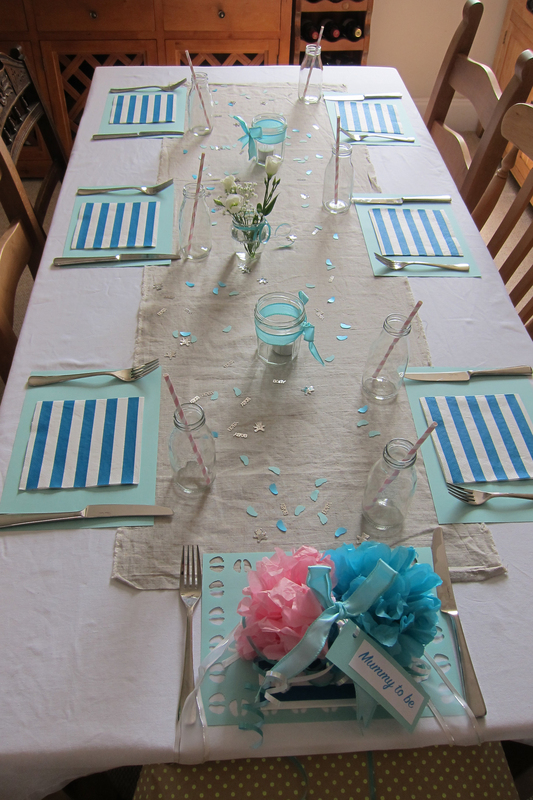 Hosting a handmade baby shower at home and spending time crafting baby shower party decorations was so enjoyable. It was a project that really got me thinking and was a chance to create a range of handmade items in quite a short time. I was really pleased with how the afternoon turned out and how the small touches were important to the overall celebration and feel of the day. 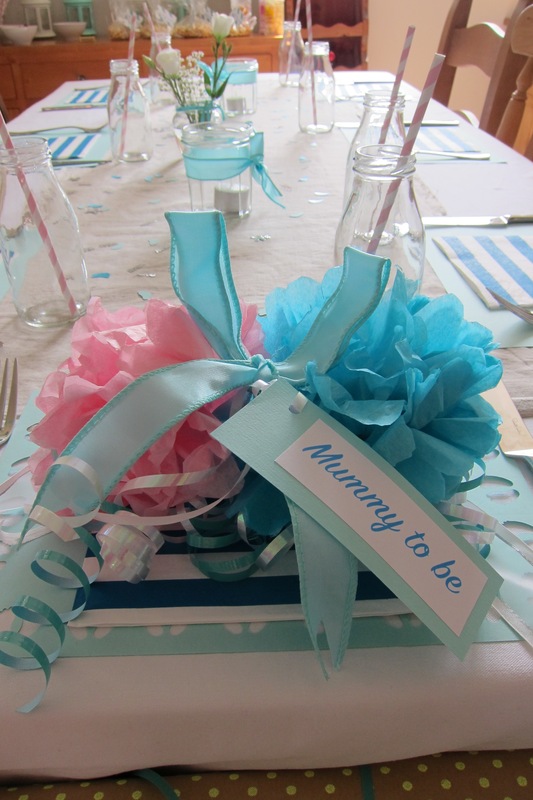 I hope that some of these ideas may have sparked a few thoughts if you are planning a baby shower or a party in the next few months.